Simply using a larger ball head isn’t really ideal, as having the weight of a hefty 400mm+ telephoto lens and chunky camera body perched on top will be a precarious balancing act. What makes a gimbal head so special is it lets you lower your camera’s centre of gravity so it effectively hangs alongside the head, rather than having it sitting cautiously on top. 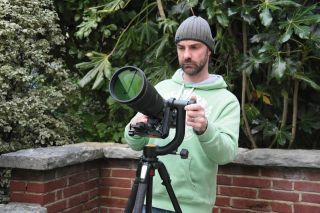 You’ll need to spend a few moments aligning your lens so it balances on the head’s mounting plate. If you decide to go for a gimbal with vertical adjustment, be sure to set this so the centre-line of the lens is parallel with the gimbal’s tilt axis. Once you’ve nailed the perfect point, your camera will effectively become weightless and able to hold any position, even if you loosen the head’s tilt lock and let go. A gimbal without vertical adjustment will do the job, but you’ll need it in order to get complete weightlessness with the camera, and the more vertical travel, the better. Loosening the clamps locking the pan base and tilt arm on cheaper gimbals, can introduce slack and wobble in the joints. Better designs will have tighter tolerances. Wildlife photography isn’t just a fair-weather activity, so be sure your gimbal of choice has large controls that are easy to grip in the wet or cold, and whilst wearing gloves. All the heads we’ve featured use the widely compatible Arca-Swiss mounting plate standard. Go for a gimbal with a long plate and you’ll also get better adjustment. There’s no point in buying a great gimbal if you’ll be mounting it on a travel tripod. Stout, rigid legs are a must, even if the combined weight will be a pain on the go. It may almost be one of the cheapest options , but stick the GH2 alongside the highly-acclaimed Wimberley head and you’ll have a tough job spotting the difference. Although you don’t get the style of the Gitzo or the customization of the Custom Brackets head, the GH2 is still an absolute pleasure to use. Its pan and tilt locking knobs are easy to lock and release when wearing gloves, there’s enough adjustment on the vertical arm for mounting tall lenses, and it includes an industry-standard Arca mounting plate. But the real test of a gimbal is smoothness, and the GH2 doesn’t disappoint. It’s a fraction less silky than the three most expensive heads here, but both pan and tilt move beautifully and smoothly and with no bearing slack. For the price, it’s rather good. We couldn’t find a camera/lens combo to completely test the Benro’s 23kg load rating, but the GH2 had no trouble supporting our beastly 4.5kg 400mm f/2.8 setup. Thanks to a 10-layer carbon fibre body, Nest’s gimbal is – albeit by a very small margin – the lightest on test, at 1.34kg. The carbon construction is also extremely strong, with Nest rating it to support 25kg. Elsewhere, build quality is fine, if not exceptional. The locking knobs are wrapped in a leather-look material that’s grippy, but can’t match the ergonomically shaped knobs on some rivals. However, this is a minor nitpick compared to the pan and tilt motion. When we last tested an NT-530H MKII its bearings had some rather unwanted slack, but Nest seems to have addressed this by tightening everything so the head is now far too stiff, and there’s no friction adjustment. Mounting a very long lens gives you more leverage for smoother movement, but you still won’t get the effortless motion offered by the best heads here. At least Nest includes a long Arca-compatible mounting plate so you can balance lenses of widely varying sizes. First impressions of the WH-200 leave you wondering why this is one of the priciest heads here. Next to the feature-packed ProMediaGear, it looks average, but Wimberley heads have a solid reputation, and it’s easy to see why when you use one. There’s plenty of vertical adjustment for mounting lenses of varying size, yet the head is still quite compact at 23.5cm tall and tips the scales at just 1.4kg. The pan and tilt axes both turn exceptionally smoothly and can be locked completely steady by grippy, ergonomics knobs. These also control the friction resistance in each joint, which is progressively adjustable. The head uses a standardized Arca-Swiss lens mount, and Wimberley offers replacement low-profile lens feet to help balance lenses supplied with a taller than average foot. This is the most satisfying head to use, but it can’t compete with the sheer value of Benro’s fantastically budget offering. Named appropriately, this gimbal is all about customization. There are no fewer than nine knobs dotted around the bracketry, with separate pan and tilt drag knobs to control resistance independently of the locking clamps. The complexity is also a result of this being a collapsible, modular design, where the horizontal and vertical arms can be separated for more streamlined storage. Another thoughtful touch is the scalloped-edge base plate that you can grip directly when mounting the head to your tripod, rather than using the pan lock for extra leverage. As you’d expect for hardware with a premium price, build quality is top notch. Everything clamps down securely, there’s no lateral play in any bearings, and the plethora of adjustment options makes it a cinch to mount lenses of all sizes. Once on board, even the heaviest glass will move effortlessly. The Katana looks more like a piece of weapons hardware than a camera support, owing to its macho design and huge 33cm height. Being such a tall gimbal does mean there’s plenty of vertical adjustment to perfectly balance even the largest lens. The stellar build and material quality results in a load capacity of 23kg, ensuring any lens this side of the Hubble Space Telescope will have a stable footing. The only drawback of such strength is that, at 2.2kg, this is the heaviest gimbal here. Maintenance-free steel ball bearings give perfectly smooth tilt and panning motion, and with no bearing slack when the locking knobs are undone. These are large enough for easy use in all weathers, plus they can be repositioned for more convenient access. You can also partly tighten the locking knobs to increase friction without introducing any jerkiness, and when fully tightened, your camera is held steady.